I don't remember where I first heard about Dan Dan noodles, but I do remember wanting to try the recipe right away. One of the things that stopped me was that it contained Sichuan Peppercorns, which are related to the citrus family and which for a long time were banned in the US for being potential carriers of a citrus virus. I first heard about them as one of the ingredients in Chinese 5-Spice Powder, which at the time what we could buy here in the states did not contain. So I decided to wait until the ban was lifted before trying any dishes that I knew traditionally used it. Not long after the ban was lifted in 2005 I saw them in my local spice shop and bought a big bag of them. And put it in my spice cupboard. Where it sat for a few years, until I finally decided I wasn't going to use them any time soon and they had probably lost all potency and got rid of them. 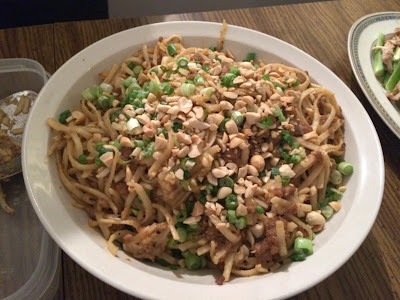 And then Bon Appetit had a recipe for Dan Dan Noodles in their October 2011 issue so I eagerly tore it out and resolved to make it soon. But I no longer had the Sichuan peppercorns. And could never seem to remember to pick them up when I was at the spice shop. Fast forward several more years to the time that we chose Sichuan Peppercorns for one of our spice-themed potlucks in my spice group. By this time I had pretty much forgotten all about Dan Dan Noodles so I was thrilled when the recipe popped up during my search for something to make and decided to make it then. I was pleased with the results. The Sichuan Peppercorns are not that hot but you can taste the citrus just before your mouth goes tinglingly numb. But not so numb that you can't still taste everything. The chili oil raises the flavor of the pork to a new level and the pork and the sauce complement the noodles perfectly. The peanuts and green onions add a welcome freshness to the overall flavor profile. The result is a spicy, numbing, tingling and surprisingly comforting dish. It was a big hit. This is one of those lovely dishes that is simple to make and has simple ingredients that come together for a powerhouse of flavor. Cook the noodles in a large pot of boiling water until al dente. Drain and transfer to a large bowl of ice water and let stand until cold. Drain well and place in a serving bowl. Heat vegetable oil in a medium skillet over medium heat. Add pork and season with salt and pepper. Cook about two minutes, breaking up pork with a spoon. Add the ginger and cook until the pork is cooked through and lightly browned, about 3 minutes more. Stir in the chicken stock then add the chili oil, red wine vinegar, soy sauce, tahini and Sichuan peppercorns and stir. Simmer until the sauce thickens, about 7 minutes. Pour the pork mixture over the noodles. Garnish with the peanuts and green onions and serve.